This is true for most industries. But it isn’t true for retail. In retail organisations, it’s unusual for there to be a breaking point moment where the customer quits your product cold turkey. Rather, you’ll see a gradual decay in sales, meaning they’re either buying less of what you’re offering or buying more from competitors (or both). This kind of early churn, known in analytics as sliding, is important to identify before the customer has actually pulled the plug on you. To give you an example of what sliding might look like, let’s say Bobby used to shop monthly at his local game store, spending on average $50 per trip. Then over a period of three months, he shopped slightly more than average but his spend decreased to around $15 per trip. Now, Bobby only shops every couple of months and spends on average $30 per trip. Though he hasn’t churned yet, his overall spend has decreased, meaning he might be considered a slider (depending on what other patterns the data shows). Seeing gradual changes in buying habits, like in the example above, could potentially be a sign that your customers are sliding – and sliding ultimately leads to churning. However, be wary, as retail data is large, messy and can often be misleading. Retail organisations have tonnes of data sending them all kinds of signals – signals that can be nigh impossible to decode at such a large scale. When looking at individual customer spending habits, it’s easy to get confused by what the data seems to show and jump to the conclusion that the customer is going to churn. Though sliding may very well be happening, there exists a natural variability within retail data that can often explain erratic customer behaviour. This nuance causes a lot of confusion, occasionally leading retail companies to market heavily towards customers that aren’t sliding whilst unintentionally ignoring those that are. As difficult as they are to identify (especially compared to the hot-then-cold examples from other industries) sliders in retail are a blessing in disguise, as they are much easier to save than those who have already churned. So therein lies the challenge – retailers have the fairly unique ability to rescue their sliders from the brink of churning, but only after putting in the analytics work necessary to figuring out who those sliders are. So how can I identify a potential churner before it’s too late? In order to identify a churner, retailers need to be able to interpret complex signals customers are sending through transactions - not only that, but they need to be able to do it at scale. This kind of analytics work requires what’s called slider modelling. Using existing data and customer profiles, you can create a model designed to run through transactional data and pick out any customers whose buying patterns align with past sliders. With such a model in place, you’ll be able to efficiently (and accurately) determine who is at risk of sliding and respond appropriately. A slider model can also be designed to sift out the high value sliders from the low value ones, as it makes more sense to gear marketing resources towards your high spend customers who look like they might churn. Once you’ve identified this group, the biggest challenge is over - now it’s time for marketing to do what they do best. Depending on the nature of your retail organisation, this might come in the form of a discount, added loyalty programme benefits or some other method of offering value - with comprehensive customer segmentation and a solid campaign platform, bringing your sliders back into the fold should be a smooth ride. 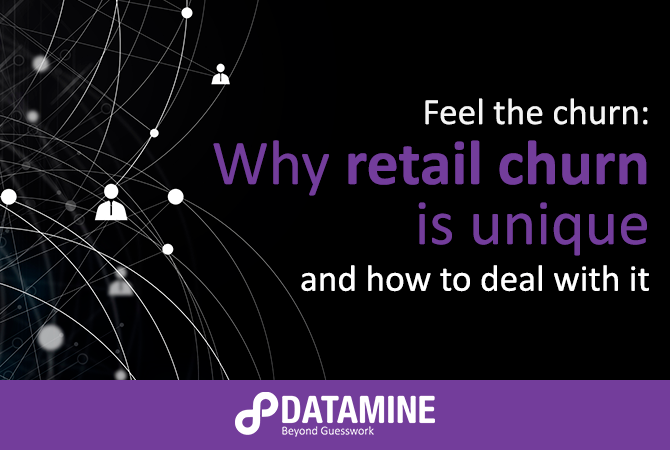 At Datamine, we’ve done many analytical modelling projects to prevent sliding and churn, including one for a large NZ retailer looking to retain and grow the spend of their loyalty programme customers. In order to do this, we built a model using two years of data to conceptualise customer behaviour and provide a framework for what qualifies (and doesn’t qualify) as a slider. Out of the nearly 300k population analysed, around 35k customers were classified as sliders based on our definition, many of which were taken into consideration when building the model. Since implementation, the model has provided some great insight on slider behaviour, offering the retailer the ability to target these loyalty programme customers before their spend declines or stops altogether. To read more about slider modelling and ways to solve customer churn, check out the free Datamine whitepaper to the right. Matt is a passionate advocate for using data-driven intelligence to identify and address business challenges. A big supporter of implementing analytics in Marketing, Matt has the expertise to balance the technical, commercial and cultural considerations required to derive value from analytics.